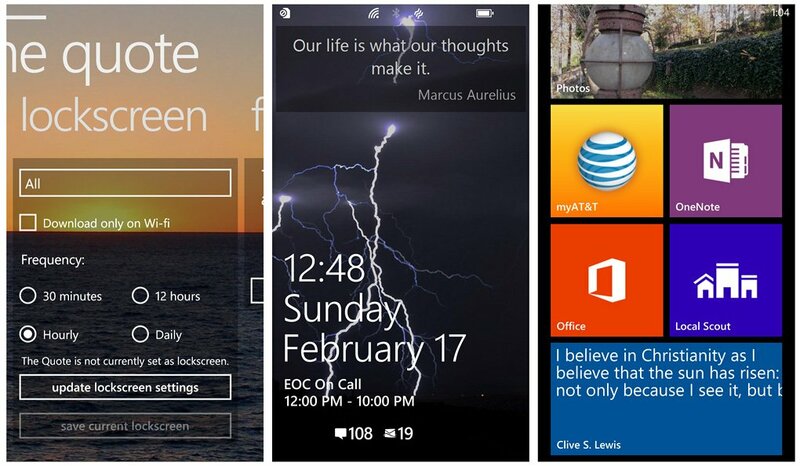 The Quote is a popular Windows Phone app that has made the leap to Windows Phone 8 offering support not only for all the screen resolutions but also support for the various live tile sizes and lockscreen support. It has been a while since we last looked at The Quote and with this recent update, we decided to revisit the entertainment/reference app. Categories Page that lists twenty-two categories of quotations ranging from technology to motivational quotes. Authors Page that randomly displays four authors with the option to display all authors in an alphabetical list. Random Page that will generate a random quote. Slideshow Page where you can generate a slide show of quotes. Lockscreen Page to set up your lockscreen that includes options for what quote category you want to use and the frequency you want the quotes to change. Settings Page where you can suggest a quote, change the background image, pin the app to your Start Screen, and rate the app. 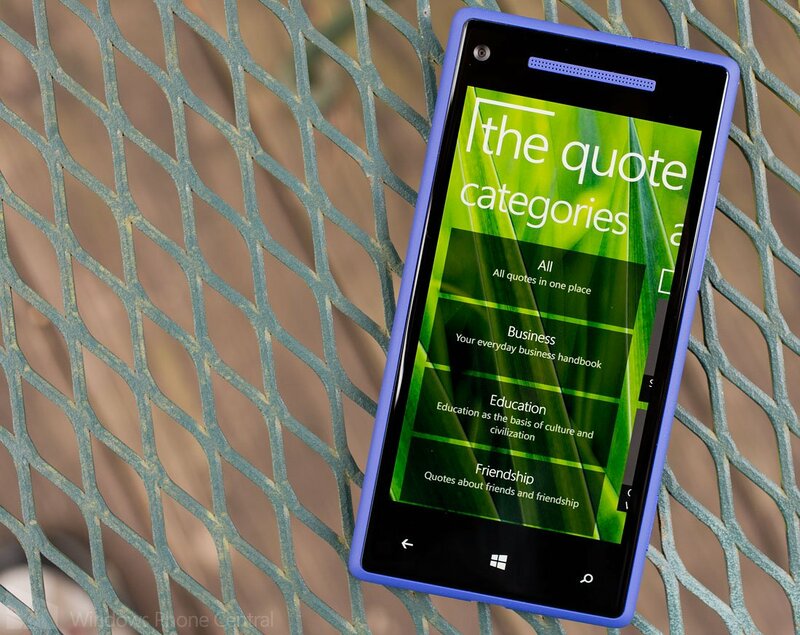 Live tile supports all three sizes of tiles with random quotes generated for the standard and wide tile sizes. If you want to narrow things down, each category can be pinned to the Start Screen as well. 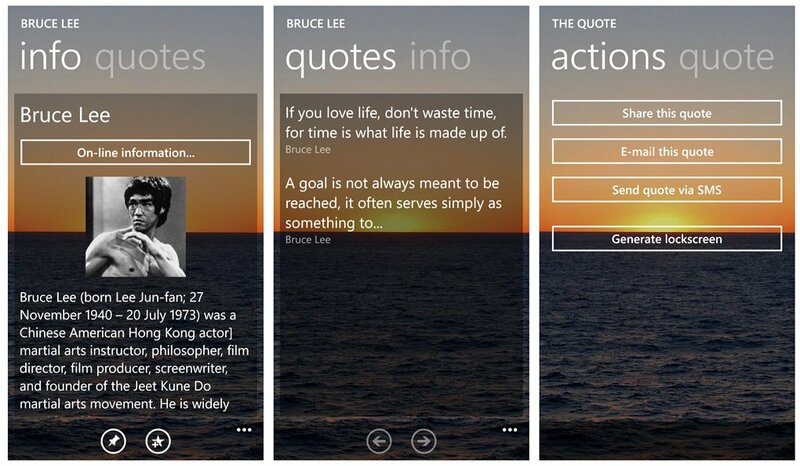 Individual quotes can be shared via email, SMS or Twitter as well as pinned to your Start Screen for easy reference. The Quote is a nice reference app and the features the Windows Phone 8 update brings to the table gives the app a little more gusto. The app seems to have a little more zip to it and the lockscreen integration can help you keep a fresh quote handy. There is a free trial version available that is limited to sixty quotes. It's enough to give you a feel for things. The full version of The Quote, which has over 3,200 quotes, is currently running $.99 but will return to the full price of $1.49 shortly. 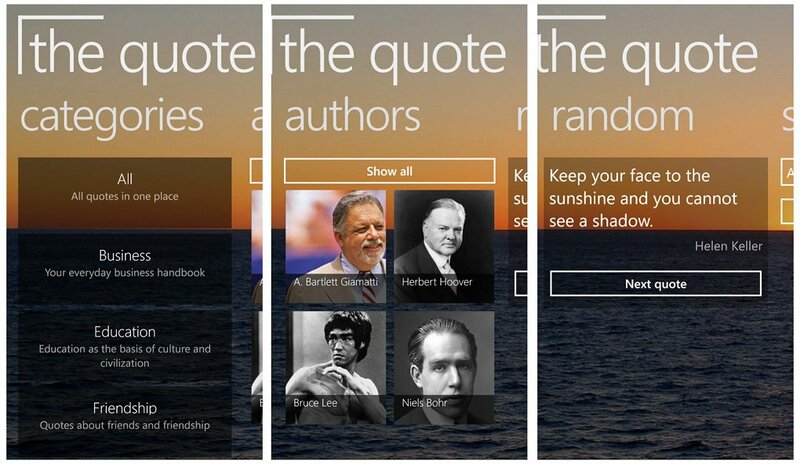 You can find The Quote here in the Windows Phone Store.